Utagawa Hiroshige (1797-1858) 53 Stations of the Tokaido Road: Okabe Station (Tokaido gojusantsugi) Reisho Edition, 1847-52. Oban. This is such an impressive piece of art. 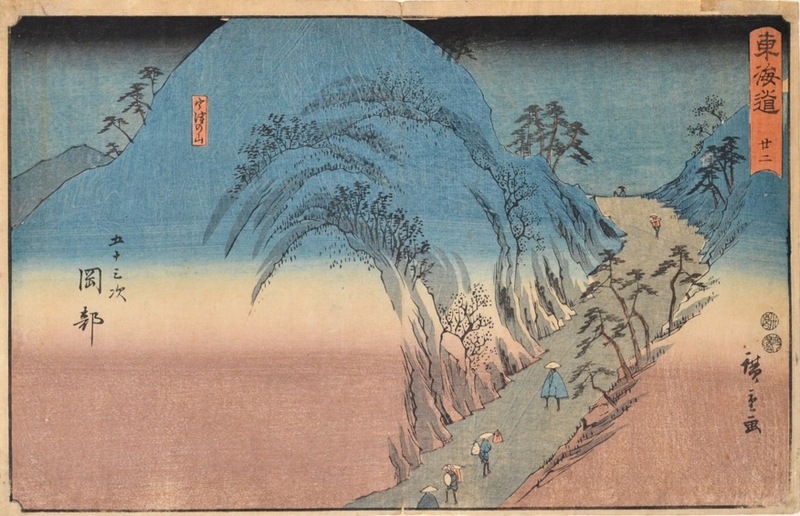 It is difficult to evaluate so much of Hiroshige’s output - he after all defined a genre - its rules and its codes, its style and its mannerisms. 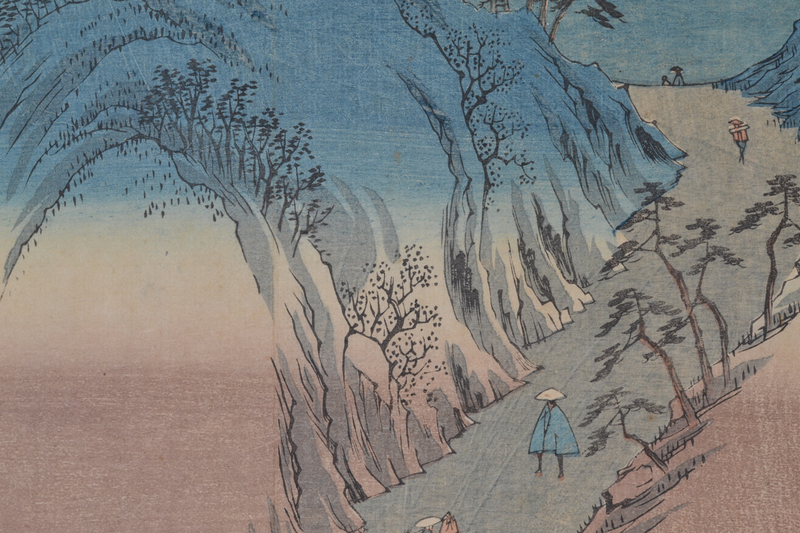 As the prints in this show illustrate, no other artists were immune from his refined vision of the Japanese landscape. Into that it is also necessary to understand that the Japanese have a different understanding of genius and of vision. The boundaries between ordinary works, economic necessity and really inspired and original work is very blurred in Edo culture. For this print there seems to me to be little doubt. The drawing and the composition have a commanding presence - a real confidence and brevity and an astonishing command of the abstract relationships between the lines that describe the mass and the form of the landscape and the colour which seems at times only arbitrarily to describe the physical features of the landscape. The originality (a first anywhere I think) in dissociating the colour and the confines of the colour from the key-line and the thing that it describes is breathtaking. Here the nominal values of sky, trees and ground are described in three, blended slabs of colour. The graphic description of the incidental detail dances in and out of these abstract planes, locking in to the horizon at crucial points. The drawing is sparse - there is no drawing at all in the lower left quarter and that which there is, is placed for aesthetic rather than descriptive purpose. Unusually, there is extensive additional mica in the dark band at the top of the print. This is a fine edition, known as the Reisho for the style of the writing in the cartouche. The print is full size, with margins. Colour and impression are very fine, condition is fine with the exception of a nick to the margin centre top and bottom and some wear to the bottom right corner.